I also agree to receive daily, relevant offers from FreeCreditClick and CreditCardCommittee. A good credit score is your passport to competitive interest rates for mortgages, cars, credit card offers, job offers, insurance premiums and more. A strong score is worth money because it saves you in excess costs. 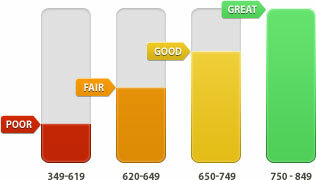 Where Does Your Credit Score Fall? *Credit scores and ranking shown above are examples only. Copyright © 2019 FreeCreditClick. All rights reserved.